Mr Gupta thought he had the case won already. He was, after all, the Indian promoter. He had enough nominees on the board. Weizmann, the company that had paid a rich sum to become his partners, didn't know much about India. Moreover, Mr Gupta had hired a brilliant senior counsel to fight his case. He had already outwitted Weizmann once - when he had hidden the true extent of his company's losses and got the multinational to pick up a stake at a huge premium. Now Weizmann was trying to get him out of the company. But Gupta was confident that his better understanding of the Indian legal maze would help him outwit it again. Only he lost. His senior counsel was outwitted because Weizmann had prepared its legal strategy better. It had hired a law firm to do enough research and work out a strategy to stymie anything Gupta could come up with. Gupta's lawyer was essentially banking on courtroom brilliance but that didn't prove to be enough. Weizmann had just taken greater care while preparing for the battle. And that was why it won. You could be legally right and still lose. You could hire a brilliant senior counsel to argue your case and then lose simply because you omitted to hire a good law firm to back him up. You could lose a case because your senior counsel and your law firm do not see eye to eye. Finally, you could lose a legal battle simply because you haven't planned the logistics well such as working out how your lawyers will travel quickly if a case is filed in another state, or because you haven't invested in a photocopier and a fax machine to quickly transmit supporting documents. But this book isn't about how to lose a case. Rather, it is about how to win corporate legal wars. It takes great pains to illustrate why preparation, timing and strategy are often more important than hiring just a brilliant counsel. And why some basic precautions can go a long way in thwarting your opponent. It also makes a big point about devoting the correct resources to the case. That's not about spending money on a big name lawyer; quite often it could mean having junior lawyers and clerks posted in various courts to watch out for filings so that quick action can be taken. The book makes the point upfront that most legal battles need you to be amoral if you want to win. And then it provides a step-by-step lesson on how to win, illustrating each point with a real case. Although marred by shoddy editing and proofing, the book is useful for any business manager who wants to understand the legal system better. IF COLUMN-CENTIMETRES of newspapers and airtime on TV bulletins are any measure, happenings-on in courts have been growing in importance. Long arm of law and sombre decisions of judges are concerned not only with criminals and divorces but also governments and policies. Whether a company can merge with another, should an advertising series be allowed to continue, is it time for lakhs of people to be denied of cartoons and movies, can a chief minister continue in office and so forth are all routine matters in current litigation. Doing business includes knowing how to manage one's legal affairs too. 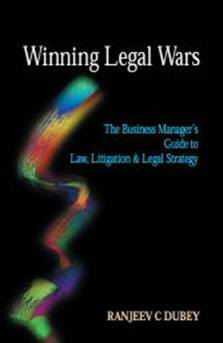 To help the business manager in `law, litigation and legal strategy', Ranjeev C. Dubey has written Winning Legal Wars, a book from Macmillan (www.macmillanindia.com). The blurb explains how the book has been broken into four broad sections: "Five golden conditions precedent that must be achieved before adopting a legal recourse, in court or outside it; five preparatory steps that must precede all legal recourse; seven rules of legal strategy; and seven rules of legal tactics." The foreword by Lord Swraj Paul notes: "While many business people have the benefit of in-house legal advice, those who do not have such support may find it difficult to take legal evaluations." The book is for the latter, providing innumerable case studies throughout. A problem with legal battle is that it does not come with a price tag; often, it ends up like a construction that is plagued by cost and time overruns. "Litigation is inherently destructive and it is resource heavy," writes Dubey in the first chapter. "Too often, those who embark on litigation do not comprehend the price they are going to pay to engage in litigation." One wonders if accountants could help in budgeting legal costs, given that their training and syllabus does not embark on such areas of real-life issues. The author draws inspiration from Sun Tzu and so the three simple components to win in law are: organisation, command and control, and logistics. Even a simple case needs an internal company man who understands the fundamental mechanics of litigation, argues Dubey. He must be able to comprehend what the lawyer says and also interact with the company's departments to get the required information. On the oft-ignored logistics, here is some tip: A case seeking interim relief could be heard within hours of its institution. "Logistics must therefore contemplate a deployment time of 12 hours at the most." The book explodes a common myth that litigation has a finite life that fits into a `prepare, fight and finish' model. "Litigation is frequently instituted as a defensive strategy, where the aim is to protect the status quo, not necessarily to achieve any new goals." Since Indian litigation procedures are `defence-friendly', it might be possible for a rival to use stonewalling tactics if he gains from preserving the status quo. To help, there is a chapter titled `plan for stalemates'. Applying art of war to law, the author configures litigation using seven basic rules: Match magnitude of engagement to resources; quick battles; optimise logistics; avoid costly annihilation; prioritise targets; factor force levels; and avoid entanglement. Here are a few one-liners to sample: Litigation is ultimately a game of economics: of sustainable cost and expected benefits. The lazy pace of litigation eventually affects the litigant. There is little benefit in hiring the best lawyer and having him push, over half a dozen hearings, a point which is not sustainable in law. The true goal of war, and litigation, is subjugation, not death. Any strategy that proceeds in ignorance of the opponent's plans is doomed to failure. Where parties are matched in strength, the litigant must engage, but it must never fight. It is very easy for a litigant to get `sucked into' a situation it cannot control, complexities it cannot comprehend. Worthwhile read between hearings, for a fraction of what your lawyers would be charging you. by Ranjeev C Dubey. Macmillan, Delhi. Pages 393. Rs 430. ONE often gets confused while listening to jargon, any jargon. More so, legalese is so confusing that one is convinced that one has to be supremely intelligent to decipher, let alone gainfully use, the technical terms related to our court proceedings and other aspects of law. Therefore, in the commercial world a manager may feel daunted by the "unique vocabulary, the unusual syntax, the very way in which lawyers use words and sentences." So, is it impossible to take crucial decisions for one not fully conversant with the complex subtleties of law? While knowledge of law is advisable, one need not be an expert in it. All one requires is a handbook that would simplify the understanding of technicalities, especially when deciding on law, litigation and legal strategy. Dubey’s tome does this quite thoroughly and effectively. This book is designed by the author to enable business executives to decide upon corporate strategies, contractual relationships and litigation related issues. The book is certainly a trailblazer as far as demystification of commerce related legalese is concerned. Winning legal wars is quite a daunting task. One has to know the legal manoeuvrings well enough and ways of not just wriggling out but also a foolproof plan to win. Winning Legal Wars by Rajeev Dubey is a comprehensive business manager’s guide to law, litigation and legal strategy. The book is a reference for the business manger, disclosing how to manage critical legal aspects of the larger business war. 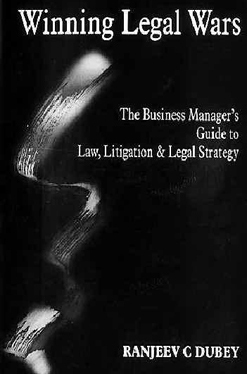 It also has a definitive work on legal strategy, a guide to managing litigation, profusely supported by actual case studies, and what lay beneath legal manoeuvres..